請問這樣free one way + 混艙可行嗎? 因為HKG-ICN + HKG-KIX 有28xx mi . 如果free one way 第2程no show 會唔會有咩後果? Hi, 既然42,000 Asia Miles 的區間沒有距離上限，咁請問 LAX > YYZ (STOPOVER) >HKG 係咪可以計 LAX > YYZ嗰段free one way? LHR – CAN (BA code share, 共要幾多AM?) 此段是否都係Business Class? 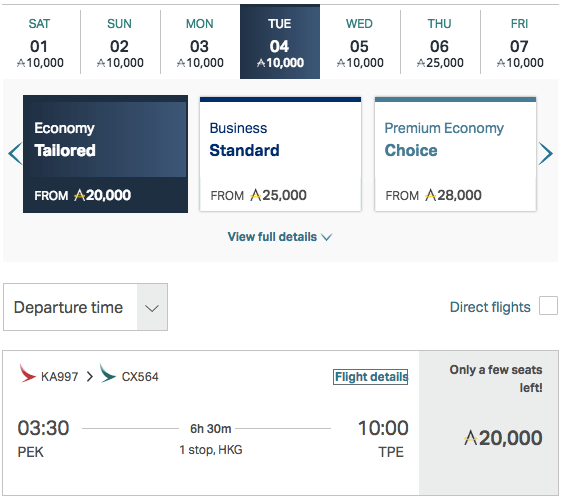 結論: option 2比option 1用少5xxx asia miles, 就算第二程台北去唔到, 都只係蝕稅, 所以無論如何都係加一程用free one way會抵d? 1. 台北-香港(CX), stopover, 香港-倫敦(BA) 係咪都可以free one-way? 香港 – 大阪 – 廈門?